Not all bar games were created equal. Well, maybe that depends on what your preference is in terms of gaming alongside your adult beverage. For centuries — millennia, really — humans have relaxed and unwinded with a combination of alcohol and games for entertainment. Sure, there once was a time where alcohol was necessary to kill all of the bad stuff in early drinking water, but we’re confident that the Romans enjoyed some post-meal entertainment in the form of games every now and then. Visit your average dive bar, pub, or even craft brewery, and you’ll notice that something remains pretty consistent among each establishment: there’s at least one, if not multiple, foosball tables to play on. Is foosball as popular in the competitive scene as it was back when it peaked in the late 70s? Not necessarily, but it’s fair to say that recreational foosball has only grown in popularity over the last few decades. Warrior Table Soccer is immensely proud to lead the lead the charge for the surge in recreational foosball popularity. We’re also proud of our roots in competitive foosball, developing rich and lasting relationships with pro players around the world. It only made sense, then, to combine the best of both worlds and create a foosball table for sale designed for the pros, but offered at a modest, recreational price. 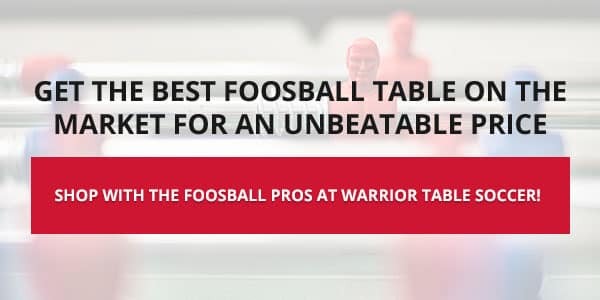 Time and time again, players agree that Warrior foosball tables are the best in class. Designed for optimal ball control with high-quality materials that last, combined with our unique rod guards that eliminate painful injuries from occurring, you’re looking at the most versatile, best-valued foosball table on the market — period. 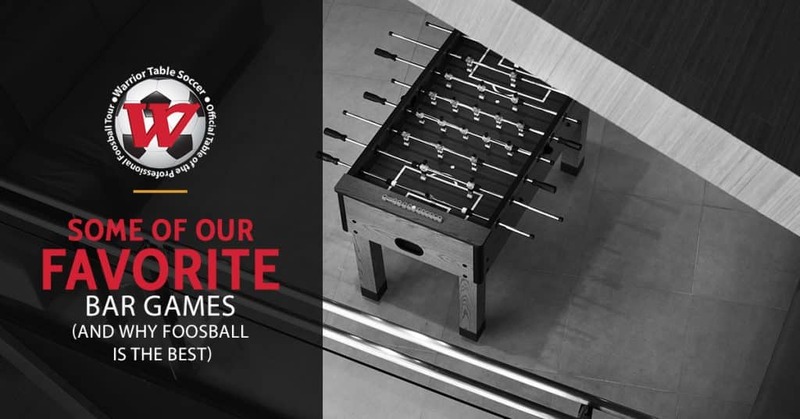 Shop our online foosball store today, check out our image gallery to see our foosball tables in action, or feel free to read below about more of our favorite bar games. Let’s get started! Aside from foosball, pool is essentially the gold standard of bar games. You’ll see pool tables in just about any size of bar, and any style of bar ranging from rusty dive to brand new and classy. Whether you call pool “pool” or “billiards” (there are important distinctions to note there, but hey, we’re not selling pool tables — we’re table soccer enthusiasts! ), there’s no doubt that it’s an ever-popular yet casual game with a longstanding history. Billiards gained popularity in betting parlors for patrons to kill time in between horse races. Though foosball tables do have rods that protrude from the table, pool cues have certainly poked many people and accidentally knocked down their fair share of drinks over the years. It’s not uncommon to see a few dartboards pinned to the wall at your local dive bar. In fact, darts also share the bar game limelight with foosball and pool. Though pool and foosball are fairly simple from a conceptual level, practically anyone can throw a dart at a board and hope it lands on the bullseye. Sure, like bowling, flawless execution tends to be extremely difficult, but there’s something that bar patrons likely appreciate about the raw simplicity of a game like darts. Just don’t accidentally walk right in front of someone else’s live dart game, and you’ll be in for a good time (remember, a table soccer ball gone awry won’t hurt you in a way that a rogue dart could). This bar game is as great as it is frequently frustrating. It seems as if you either throw the shuffle pieces too hard and send them flying off of the board, or you daintily nudge it and it stops only halfway across. Fortunately, it is a simple game on a conceptual level, though knocking your opponent’s shuffle pieces off of the board may incite some justified animosity. Given the casual appeal of shuffleboard, we’re quite certain that games like foosball and pool are more popular at the competitive level. Can’t make it to a real bowling alley? Skip the gross bowling shoes and head over to your local barcade. It’s true that skeeball is more of a “premium” bar game compared to your standard set of foosball tables or pool tables (skeeball typically requires multiple quarters to operate, after all), but it sure is fun. It’s a fast-paced but low-pressure game where the biggest decision you have to make is to go for the 50 in the center, or take the risk of landing a 100 in the corners. It seems like air hockey has dropped off in popularity over the past several years. We’re not sure why, because it’s a lot of lighthearted fun. Maybe one too many players received an air hockey puck to the face? In any case, there’s definitely something nostalgic to air hockey. Requiring a great deal of hand-eye coordination, ping pong is probably the most cardio-driven bar game out there. With that being said, it’s also not a very popular bar game, and that’s likely due to the fact that ping pong takes up a lot of space. Players also spend at half least of the game going around and chasing the ball, which is often problematic at bars. Buy A Warrior Foosball Table And Enjoy Fun For Life! Fast and easy to assemble, delivered straight to you, and complete with the highest-quality materials for the price, we’ve created the best professional foosball table for sale designed for…well, everyone! Read more about what to look for in a foosball table, and then shop our signature foosball table today.